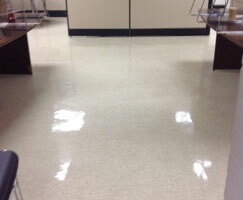 At AC’s Janitorial Service, we know that your office is a representation of your company. To keep it looking its best, we offer commercial cleaning services by our professional team to companies in Brevard and surrounding areas of Western North Carolina. Every one of our employees understands the importance of doing their jobs to the highest standards in order to meet your individual needs. Using advanced procedures and the latest technology, we make sure that you and your staff have a clean and healthy environment to work in. We care about cleaning, and it shows in our work, our commitment, and our accountability. As a local commercial cleaning company, we can offer the flexibility to meet your needs. Whether you need one-time, weekly, or bi-monthly commercial cleaning services, we’ll get the job done to your complete satisfaction. And since every business has different requirements, we offer different cleaning options. Our office cleaning services include restrooms, kitchens, and break rooms. We also provide commercial floor cleaning in North Carolina such as routine and specialized carpet cleaning, vacuuming, spot cleaning, and shampooing. We’ll also clean fabric partitions (including cubicle walls), as well as windows and furniture. We offer special seasonal promotions as well. For example, we can help keep your office free of germs through carpet cleaning, desk polishing, and phone sanitation during cold and flu season. It’s a small step that can pay big dividends in productivity and employee morale. AC’s Janitorial Service is trusted by many companies throughout the Brevard area. We’re especially known for our quick response. Choose us and you’ll quickly see why customers rely on AC’s Janitorial Service for healthier commercial cleaning, dependable communication, and consistent service. Our staff is always ready to answer your questions or address your concerns. We believe in effective communication and it shows in the relationships we’ve built with our clients. Call us now to see how we can help your commercial space stay cleaner and healthier.